In 1932, the great psychologist, Carl Gustav Jung, wrote a perceptive analysis of Picasso's psychology, after visiting an exhibit of his paintings at the Zürich Kunsthaus. Jung's analysis was published in the Neue Züricher Zeitung. The article, offended a large number of Picasso's admirers because Jung referred to Picasso as a Schizophrene. It caused such a reaction that Jung felt it necessary to publish an explanation. If his artworld critics had spent a little more time appraising the article, they would have noticed that Jung's observations were made on the basis of clinical research. Jung, believed that Picasso's paintings were interpretable from a clinical perspective. Picasso's use of disturbed and fantastic imagery indicated to Jung that these images were arising in the artist's subconscious. Jung, without hesitation, identifed it as schizoid in a clinical sense. This evaluation, was not a condemnation of Picasso's state of mind, because Jung saw in the painter's art, an important process taking place, which he termed, the Nekyia, the descent into hell. To Jung, this was very important, for only by sucessfully undertaking such a journey, could the individual come to terms with himself, spiritually and psychologically. Picasso, like Jung, had an great interest in symbols. It was from Picasso's use of symbols, that Jung recognised the Nekyia journey in process. Indeed, it was from a similar experience, which Jung had undertaken,* that permitted the psychologist to speak with authority about Picasso's art, although he was careful not to predict the outcome of such a dangerous inner journey. Jung and Picasso were both practioners of Alchemy. As far as Picasso is concerned, this was an important feature of his art, which is often paid lip service to, but rarely investigated. Jung, on the other hand, openly introduced Alchemical principals to the study of human psychology. Many of his ideas concerning alchemy, have since been embraced by psychologists around the world. 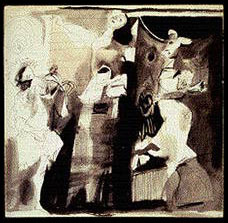 Picasso however, incorporated Alchemical meanings in his art, on a secretive level and in the true artistic tradition. Perhaps, in the belief that one day, his work might be better understood. The 1934 drawing corroborates Jung's analysis of Picasso to a staggering degree. It reveals Picasso's Nekya experience in it's penultimate stage of development. It presents us squarely with a multidimensional vision of the artist's vision of hell. * By this I refer to the mysterious period in which Jung wrote his, "Seven Sermons to the Dead."